Military operations are always event driven. Yes, there is a timeline based on expectations, but it's ALWAYS driven by milestone events. Timelines are driven by tenacity. In confirmation of a move first announced by President Donald Trump via tweet last December, the Pentagon confirmed Tuesday that Army Chief of Staff Gen. Mark Milley has been nominated to succeed Marine Gen. Joseph Dunford as chairman of the Joint Chiefs of Staff. Dunford will reach the end of his four-year tenure as chairman this fall. Might be notable as this might make Dunford a "placeholder" in reverse. Anyone thinking there is no evidence of spying on Trump campaign is simply whistling past the graveyard. All of weaponizing of the intelligence apparatus against candidate Trump was clearly done with the firm belief Hillary would win and their dirty deeds would go undetected and 16 years of entrenching said weaponizing would carry on for decades. The election results pushed the DS into crisis mode and here we are. As someone stated above, tables turned with Mueller report and Barr/IG are on the offensive. The problem with the Dem situation in how their hubris drove the bus, there are no low/mid level entities to take the hits. All of the bad actors are senior position holders. I’m still a healthy skeptic that justice will be served but if it ever would happen it’s under this President. The media and Left lost all credibility going forward in their failed coup attempt. Mix in this Socialist movement; it won’t end well for them. Someone has to go to jail. How many will be interesting. Woo-hoo.....Candice Owens exchange with loony Lieu was finally covered on The Ingram Angle tonight ! lol...I called Fox News this morning and left a message on the hotline " Hey, what's up, why no coverage of epic CO testimony to Congress ? " Probably was one of many that called and complained, but makes me smile she's getting the recognition she deserves. Right on Laura Ingram. Think I got that Q countdown/sequence of events/milestones figured out. It's a cryptic timeline to the release of Tool's new 2019 album... majority speculation is June timeframe but the window is mid-May - July. Tool’s new album 4600+ days later...soon. 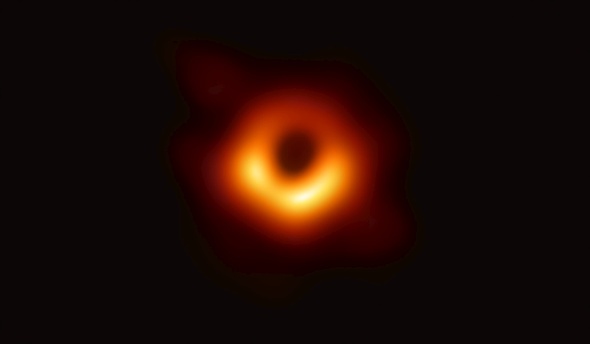 Here is the first photo of a black hole inside galaxy Messier 87, released today from the Event Horizon Telescope. Lots O' orange in the image. In the image, you’re seeing tiny bits of light — photons — that managed to escape the area near the event horizon, a boundary where the black hole’s massive gravity drags all nearby matter beyond the point of known perception. Hey y'all, looks like Gen Flynn has joined quodverom as of April 9. Still up and running. Thank you all for your support! Loved reading the replies of support, So much respect for this man. Anyone on there, drop him your wishes of support. This article was making its Twitter rounds today. Kind of strange, considering that its 4 years old. Astronaut Mitchell: UFOs shoot down missiles over White Sands Testing Range, to deter a nuclear conflict. I hope Flynn is pardoned after the Mueller Report is made public, and he proceeds to sue the govt for $100 million. Next, Papadopoulos and Stone pardoned together. Maybe Manafort too.